French revolutionary Maximilien de Robospierre sentenced over 17,000 “enemies of the state” to death by guillotine during an 11-month Reign of Terror in 1793. One might never have guessed this man's "finale" by looking at his political life. During earlier years Robospierre gained a reputation as a legal defender for the poor. Having earned a law degree he was practicing law in Arras when he got involved in the political movement against the French monarchy. He earned the nickname “the incorruptible” in those years because of he liked the philosophy of Jean-Jacques Rousseau and followed the principle strict moral values. By the time he was 30, Robospierre was elected to the French legislature. His attacks on the monarchy and his public call for democratic reform made him popular with the people. At this time he actually opposed the death penalty and slavery. In 1789 Robospierre had left the legislature and was getting heavily involved in the revolutionary movement. 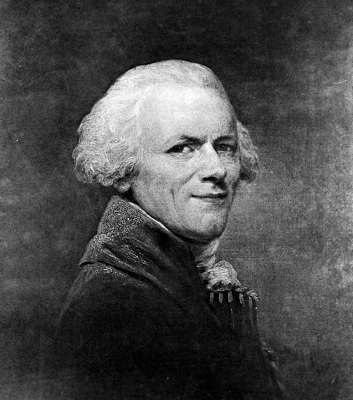 He was elected president of the Jacobin political faction and participated in writing the Declaration of the Rights of Man and Citizen, a document that became the foundation of the French constitution. After the people overthrew King Louis XVI in 1792, Robospierre was elected to head the Paris delegation to the new National Convention. His popularity was at a high point. But something happened at about this time. Robospierre began arguing for the execution of the king. In 1793 he was elected to the Committee of Public Safety, a group that was given virtual dictatorial power to establish a new government. Caught up in the Revolutionary fever of the day, the committee he chaired instituted its Reign of Terror. For the next 11 months an estimated 300,000 suspected enemies of the Revolution were arrested. Of these, more than 17,000 were sentenced to death at the guillotine. Some said Robospierre appeared to be intoxicated with his power over people’s lives and their deaths as he called for more and more purges and executions. By the summer of 1794 the people close to Robospierre were questioning his motives. On July 27 that year, Robospierre and some of his allies were arrested. He escaped the jail and hid out for a short while in Paris. But he was soon discovered and arrested again. The following day he and 21 others were executed. Perhaps because the killings got so out-of-hand, the Committee of Public Safety lost its credibility and the Revolutionaries fell into the old kind of corruption the people had fought to overturn. The new government was in turmoil. In 1799 Napoleon Bonaparte led a military coup that overthrew the bungling system. By 1804 Napoleon proclaimed himself emperor of France. It seems that if Robospierre had been able to “keep his head” during the critical days of the French Revolution, he might have gone down in history as a popular leader of France, and we never would have heard of Napoleon.